Golfers visiting the Blackpool area will not be disappointed as there are plenty of golf courses just minutes away. Many of the golf courses in this part of Lancashire boast spectacular scenery and a number overlook the Lake District, where the breathtaking views are almost distracting during the game itself. Most of the golf courses both in and around Blackpool offer a range of facilities, including a clubhouse, where you are able to relax and have a drink after your round. Here are Blackpool's main golf courses. The North Shore Golf Club is a championship golf course and is easy to find, lying off the A587, behind the North Promenade. Featuring a rather undulating terrain and spectacular scenery, the course is set in almost 100 acres / 40 hectares and boasts impressive views of the nearby Lake District area. Other golfing highlights include rolling fairways, a popular clubhouse complete with restaurant and snooker tables, and a yardage of 6,400. Green fees here are moderately priced and tend to be slightly more expensive at the weekends. The Blackpool Park Golf Club is extremely close to the town centre and is just 1.5 km / 1 mile from the Tower itself. With an appealing parkland setting, the course offers 18 interesting holes, a yardage of just over 6,000 and reasonably priced green fees, including mid-week discounts. The De Vere Heron's Reach golf course comprises 18 holes and is just a short distance from Stanley Park. 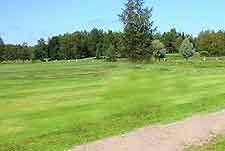 Covering a vast area, this course features ten large lakes, a driving range which is floodlit, a putting green, a bar serving refreshments, and also a hotel and leisure complex. The course stretches for approximately 6,500 yards. Located approximately 5 km / 3 miles to the north-east of central Blackpool, the Poulton-le-Fylde Golf Club is around 6,000 yards and suits most levels of player, with a number of challenging holes along the way. Set in a particularly scenic valley, the golf course features 18 holes, practice greens, inexpensive day tickets, a bar serving snacks, and a nearby public house.